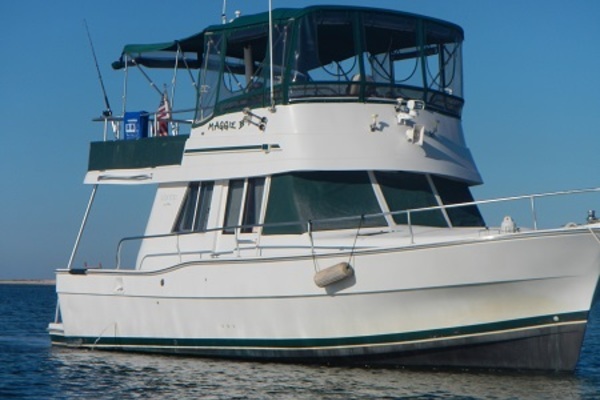 United Yacht Sales New Jersey would love to guide you through a personal showing of this 44' Marine Trader Trawler 1978. This yacht for sale is located in Palm City, Florida and priced at $65,000. For a showing please contact us by filling out the form on this page and we will get back to you shortly! "Good Times" is a two stateroom, two head layout with tub showers, classic galley down with wide walkaround decks.Entrance to the salon is from either starboard through the helm door or aft on the portside. Behind the helm is a large L-Shaped settee with a gorgeous high gloss teak table. Forward of the salon are the VIP cabin with V-Berth in the bow with the guest head to starboard. The large galley is portside on this level. Going aft from port salon down 3 steps you enter the master’s cabin with portside queen berth, en-suite head to starboard and steps leading to the aft lazarette.The teak parquet flooring running throughout the interior of the yacht is in great condition and the salon features two occasional chairs and plenty of storage with drawers and book shelves. Salon is midship and features a large L-Shaped dinette area with seating for five and a gorgeous teak table with folding leafs. Two occasion chairs. Topside, deep bulwarks and wide side decks make it easy and safe to get around outside. Additional features include a mast and boom assembly, a big engine room, generous storage, and a spacious flybridge. 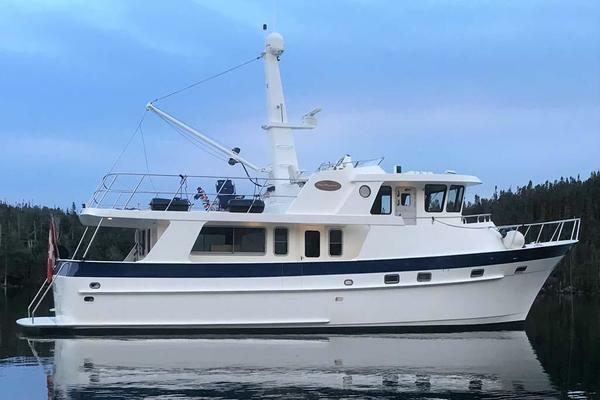 Having seen many of these trawlers over the years, I can say that this boat is in above average condition and certainly should make the top of your list for your consideration when shopping for similar boats. This boat has never been used as a live-aboard to the owner’s knowledge and is smoke and pet free devoid of any unpleasant odors. Windows and portholes do not have signs of recent leaking. All canvass is in good condition. Boat is due for a bottom job.Latest survey from August 2017 is available for review with accepted offer along with previous oil analysis for engines and transmissions. Receipts and documentation for improvements and repairs available for new buyer.Boat has newer air conditioning units. Both fuel tanks replaced with aluminum tanks totaling 420 gallons, also newer plastic holding tank.